For a summer theme on summer bulletin boards use the ideas in this example. A raincoat and boots with a puddle of water can be placed on the board for climates where it rains in the summer months. Make the puddle out of blue paper. Use a cheap raincoat to attach to the board, or print the image from the template on the right. Stick double-sided tape of varying thickness behind the cloud cutouts, so that some clouds stick more than others. Make the sun out of cardboard. Alternatively, crochet the sun by doing a long row of chain in reds, oranges and yellows. Roll it up to form the centre of the sun. Cut shapes for the sun's rays out of tissue paper or coloured paper. Wool can be used as well. Use glue in a bottle with a nozzle to form the outline of each ray and place a strand of wood along the glue. Tape notices to it with a couple of strips of masking tape. This board has two speech bubbles that can contain writing or messages. Coloured cutouts of sunglasses or brightly coloured sunglasses can be positioned to hang over the top edge of the board. You could also use beach imagery with footprints in the sand. Cover the lower half of the bulletin board with yellow paper representing sand. Sand can also be glued onto a strip that goes along the bottom of the board. A blue strip of paper can be used on the top half of the board for the sky. Add pictures of starfish, beach balls, umbrellas, sand pails, the sun, tall cool drinks and sunglasses. Staff could contribute vacation photos. Add a new vacation area label to the board each week. A pair of real sunglasses or an armband can be attached to the board for a 3D effect. Have a picture of a summer scene covered by flaps that open up like an advent calendar. When the flaps are open they reveal smaller images. This could be used for any season and would work well as a border. Prepare ‘month at a glance' pages that include summer pictures made from recycled paper. 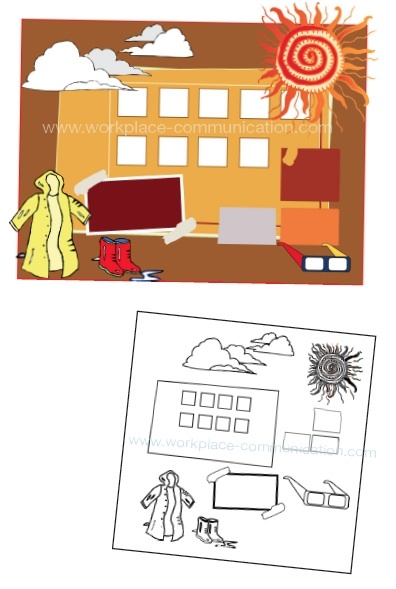 Divide the seasons between departments and get staff to illustrate them. Pen and ink illustrations could be used as well as photograph. Punctuality: Coming to work on time can be a problem. A notice on the bulletin board which might highlight the ones who are punctual can create an interest to be more punctual. Infection: If there is a viral infection spreading in the office, there can be an attractive poster on the bulletin board on awareness about the disease, treatment (first aid) and precautions. Training programs: When the office organizes training programs, an effective notice must be displayed on the bulletin board which can encourage them to participate by registering. Blood donation: If the office organizes a blood donation campaign, the staff can be encouraged to participate and donate blood by getting them to write their names on the bulletin board. New staff members: Newcomers can be greeted personally. Pictures of new staff members can be put on the bulletin board. Welcoming them in such a manner creates warmth. Promotions and upgrading: When staff is promoted to a higher job, their names can be put on the bulletin board prominently. Bar-b-que: The office can organize a bar-b-que in the office premises or another place and get everyone to join. The bulletin board can be decorated with a picture of a bar-b-que and get the staff to participate by way of organizing the food, chairs, coal, drinks, crockery, cutlery, singing time, musical instruments etc. Picnic: The managers can organize a picnic or a day out on a mountain or by the beach and have it announced on the bulletin with games being organized, maybe volley ball by the beach. Christmas: Christmas and New Year are special! Hence the whole bulletin board can be decorated with poinsettias and holly leaves to bring the real Christmas feeling and atmosphere into the office. Almost all the females can be used to decorate the bulletin board and the surroundings. Attendance can be monitored by way of an attendance chart on the bulletin board. They can be further encouraged by giving away a mini award for the one with the best attendance every month or every 4 months. A general health day/clinic with reputed doctors can be organized & promoted free of charge for the entire staff using the bulletin board for publicity. The Company President's (Boss) birthday can be celebrated through liaising via the bulletin board where staff can bring their own ideas as to how they should organize the entire event. A secretary's day can be organized at a good hotel with games, films, good food etc. An invitation of this event can be extended to nearby organizations or sister/brother companies or even competitors. All those who are interested can write their names on the bulletin board. A beauty contest can be organized within the company. The entry forms with do's and don'ts can be displayed on the bulletin board with a nice picture of a previous beauty queen to create interest in the competitors. 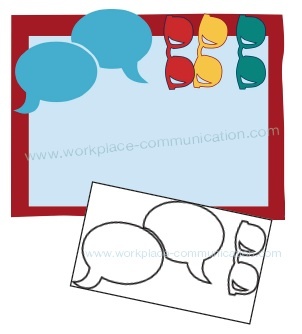 Bulletin boards in the workplace are still an effective form of communication.